Chancellor commits to working with the All-Party Parliamentary Group on General Aviation and UK Aviation sector on VAT flight training. The Chancellor of the Exchequer has written, after meeting with the APPG on General Aviation (APPG-GA), to highlight the importance of flight training in the UK. Recognising that “new pilots are essential for the growth and sustainability of the UK aviation sector” the Chancellor has said that H.M. Treasury will continue to work with the APPG-GA and the aviation sector. The Chancellor also agreed to continue to explore the challenges affecting the industry. These findings will be included in the upcoming Green Paper, being published in partnership with the Department for Transport. Although it was disappointing that the Chancellor ruled out the zero-rating or applying a reduced VAT rate on flight training due to current EU law, the APPG-GA will continue to campaign on getting this law changed, perhaps through greater post-Brexit flexibility, or through working to find another way to mitigate these costs in order to make flight training more accessible. The meeting between the APPG and the Chancellor, the Rt. Hon Philip Hammond MP, took place in July to discuss the negative effects VAT is having on the UK aviation sector, especially with huge fall in commercial licences being issued in 2017. In the meeting, representatives of the APPG also asked for the Chancellor to commit H.M. Treasury to look at the other issues facing the UK aviation sector, to ensure that it continues to thrive. “Whilst it is disappointing that the Chancellor feels unable to immediately reduce VAT on flight training, it is encouraging to see that the government is beginning to become aware of the issues facing the UK aviation sector. It is clear that solutions are still required and whilst we accept that we won’t see them in this budget, we will want to see progress soon. “We appreciate that there are complications in making flight training free of VAT, but the APPG-GA will continue to campaign to make flight training more accessible and cheaper in order that we can fairly compete for important STEM based training to return to the UK. “This is the first time a Chancellor has committed to working with the industry to support the UK aviation sector. The APPG-GA is looking forward to the joint Treasury and Department for Transport Green Paper on the aviation sector”. 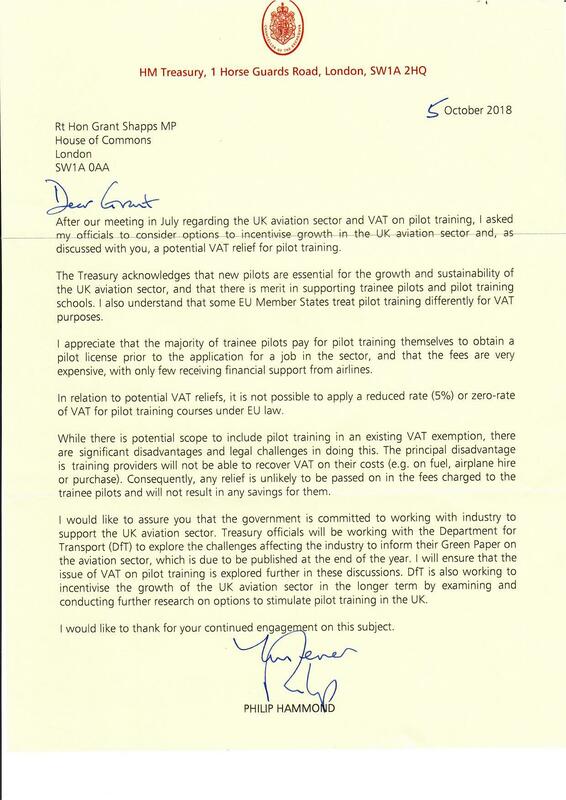 “It is disappointing that a Chancellor, sympathetic to the cause of STEM pilot training, was advised that reducing VAT on Professional Flight Training is unlawful under EU regulations. “The APPG will question why the UK cannot lower VAT on Professional and Private Training, particularly given that this was possible under the NVQ scheme up until June 2001 and that other EU nations still offer VAT free Flight Training today. For further information, please contact APPG-GA Deputy Head of Secretariat George Lawley at George.lawley@generalaviationappg.uk or on 0207 219 8599. A copy of the press release can also be downloaded as a PDF here.